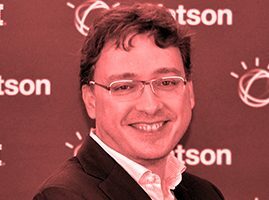 IBMer for 21 years, he is Vice President of IBM Cloud, responsible for Cloud Business, Artificial Intelligence and Software in Italy. A quick snapshot: seven years international experience, business leader in charge of small and medium-sized European companies, European leader for Ecosystem development, lead and development of indirect channels, management of business units in software and systems, sales manager for large customers, digital sales and marketing, people development and management. He launched the first IBM business accelerator and managed the Start Up development programs in Europe for 2 years. He gained a degree in Economics at the Catholic University of Milan, an MBA at Henley Management College, and a professional certification at INSEAD.